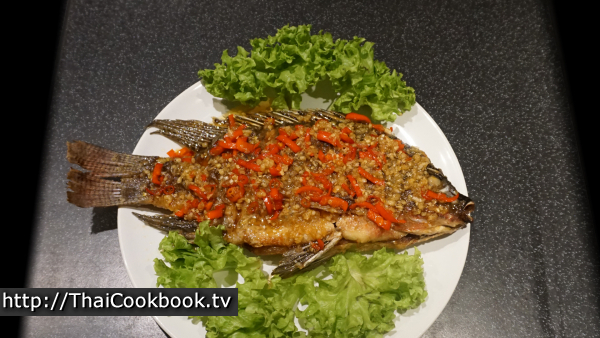 This crispy pan-fried fish has a sweet and spicy sauce made with lots of hot chili and garlic. 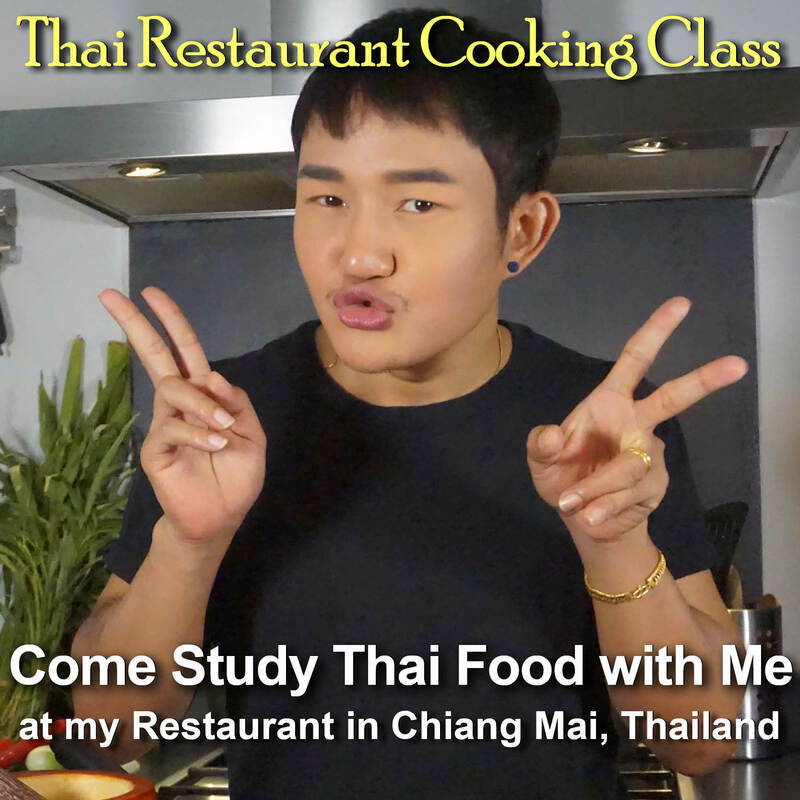 Known as Plah Tub Tim Rad Prik, it is a very popular dish in Thailand that is often ordered as part of a large family-style meal for special occasions. 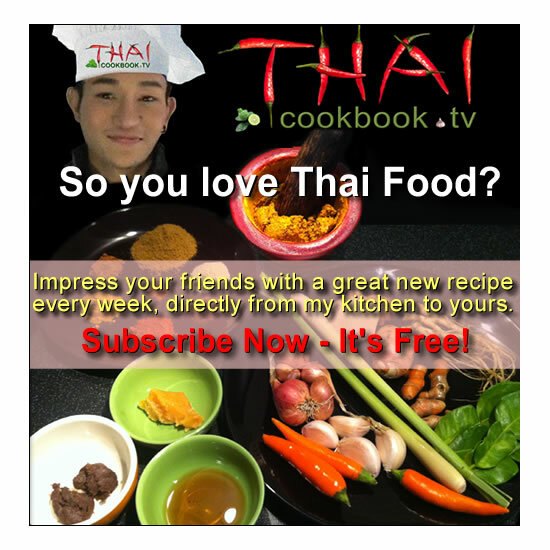 Most Thais would not make it at home, as it can be a little messy to cook, but it is really quite easy to do. 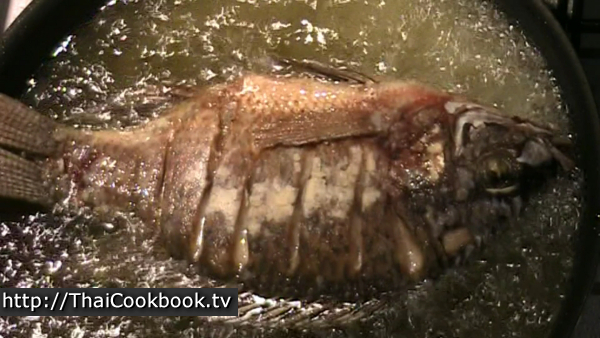 The fish we used here is the Nile Talapia, which is known in Thailand as Tub Tim. 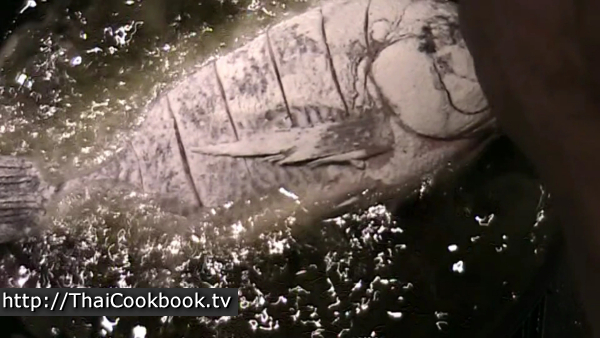 It is a farm-raised freshwater fish that fries up nicely and has solid juicy meat. You can do this recipe with any kind of fish that you would normally fry, such as Bass, Bluegill, Crappie, or other perch-type fish. The sauce is simple. It's just sugar, hot and mild chilies, garlic, and fish sauce. 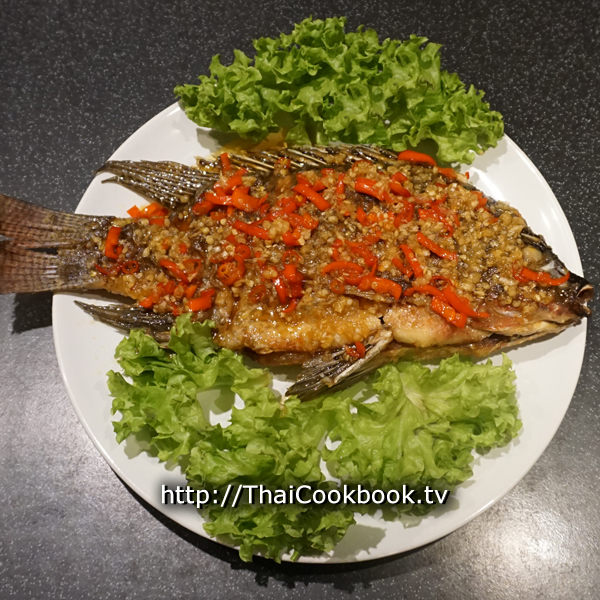 What's in our Fried Fish with Sweet Chili and Garlic Sauce. 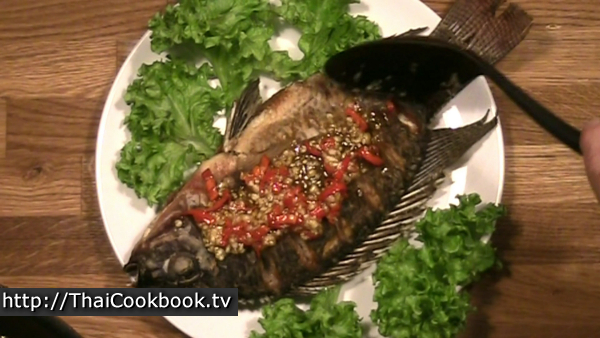 How we make our Fried Fish with Sweet Chili and Garlic Sauce. 1) Coat the fish in flour and fry it in deep oil over medium heat for about 5 minutes on each side, then remove it to a wire rack to drain the oil. 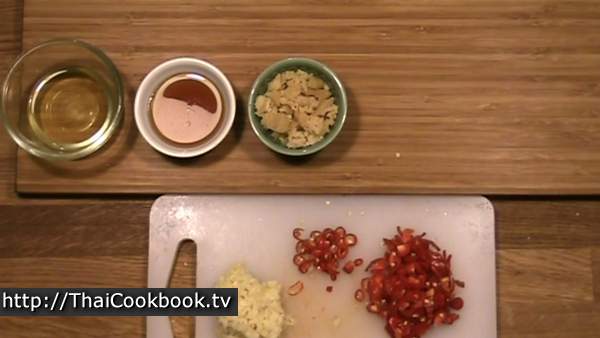 2) Pour the oil from the pan, leaving just a little to coat the pan, then add the chilies, garlic, sugar, and fish sauce. Fry until it make a rich and sticky sauce. 3) Arrange the fish on a nice plate, then pour the sauce over it. Serve with steamed rice and other foods for a complete meal. Scale and clean the fish as you normally would before cooking, leaving the head on. Score across the body on both sides with a sharp knife, all the way to the center bone. 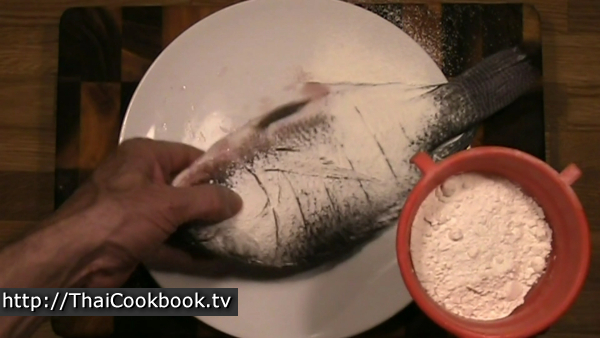 Dust both sides of the fish with a light coating of all purpose flour. Heat enough oil in a large flat frying pan so the fish will be nearly submerged, but not floating. The temperature of the oil should be about 140°C / 280°F so it is at the low end of deep frying temperature. Lay the fish in the oil and fry until golden brown on the first side. Avoid moving the fish around, just let it fry until done. While the fish is frying, get the ingredients for the sauce ready. I use the mild chili, and then just a little hot chili to spice it up. You can use more hot chili, the more spicier you want the sauce to be. Just use about 2 tablespoons of chopped chilies in total. Also chop the the garlic very fine to get about 2 Tablespoons. 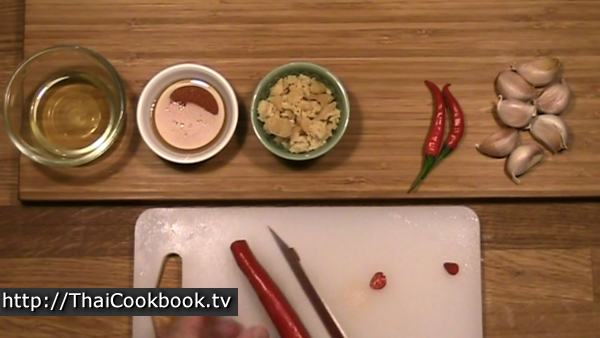 Generally, the sauce is equal amounts of chili, garlic, fish sauce, and sugar, and then just a little oil. When the fish is nice and brown on the first side, turn it over. It will probably take less time for the second side, and watch that is doesn't burn. This kind of fish tends to dry up and turn into nothing but crispy bones if you overcook it, so you want to remove the fish a little sooner than you might think, so the meat is still soft and moist. Remove the fish to a wire rack so it can drain the oil away completely. Pour all the oil out of the pan, leaving just a little and whatever crispy leftovers there are from the fish. 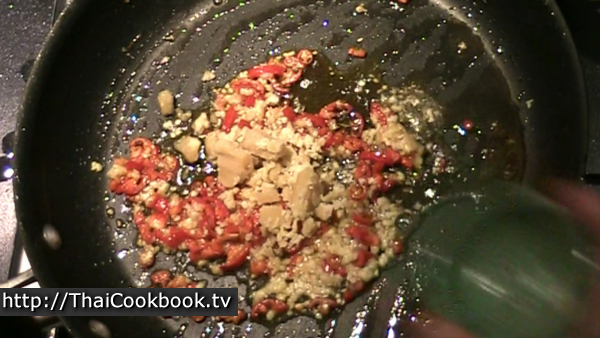 Add the garlic and chili and fry it over low heat for a couple of minutes. 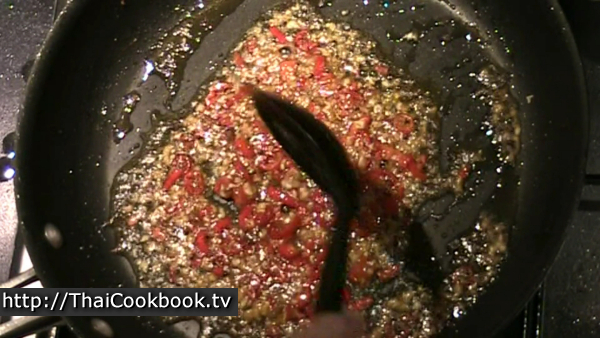 Add the fish sauce and sugar to the pan and stir it up well while the sugar melts completely. When the sauce is nice and sticky, it's done. Be careful not to overcook it or let it get too hot, as the garlic can burn easily at this point. Arrange the fish on a serving plate however you want. Here I just used some lettuce on the side for a little greenery. Spoon about half the sauce over the fish, then pour the other half in a small bowl to be served on the side. In Thailand the fish is shared at the table and eaten using off the bone on the first side, before flipping it over to finish it off. Add the extra sauce to the second side. Serve with steamed rice and other foods for a complete meal.